Next group of J20 inauguration protestors prepare for trial. Jury selection begins May 14. Washington, DC – On May 14th, jury selection begins for a trial of four J20 defendants charged last year with felonies, including engaging and/or inciting in a riot, conspiracy to riot, and five counts of property destruction during the 2017 Presidential Inauguration. This trial group initially included six defendants, but was reduced to four after last week’s pre-trial motions hearings. The defendants are Michael Basillas (pronouns: they, them), Seth Cadman, Anthony Felice, and Casey Webber. Last Friday, Judge Robert Morin announced Judge Kimberley S. Knowles as presiding judge over this trial. DC Superior Court Judge Robert Morin took over the case from Judge Lynn Leibowitz on January 1st, 2018. On January 19th, the prosecution dropped charges for over 100 defendants included in the 2017 indictment. To date, 58 defendants are scheduled for trial in 2018. Several trial groups originally scheduled for March and April of 2018 were continued after the prosecution pushed for a controversial expert witness, which was denied by Morin on April 6th. The trial beginning May 14 does not have an expert witness. Last week saw three days of pre-trial motions in which Judge Morin continued the trials of two defendants in this group: one in particular was continued for insufficient evidence linking them to the government’s conspiracy charge. Assistant U.S. Attorney Jennifer Kerkhoff was instructed by Judge Morin to thoroughly review the other 58 cases for similarly situated defendants. The other defense attorneys representing May 14 defendants provided their own strong arguments against the government’s proof of conspiracy as it related to their clients. Online materials publicizing the march were publicly available, and articulated nothing beyond “disrupting conveyances”. Wearing a particular color was described as a show of political solidarity and compared to fans of the same team at sports events. Defense attorneys also pushed against the admissibility of observations by undercover officers at events prior to January 20th. The government’s conspiracy charge did not win convictions for six defendants late last year, who were acquitted of all charges. One notable difference between this week’s trial and the previous J20 trial is that some defendants are specifically accused of property destruction. Nonetheless, many of the arguments made during the November 2017 trial are also relevant to this next trial. 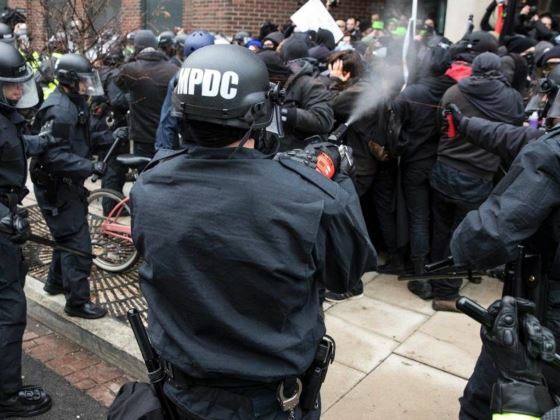 Last fall, defense attorneys highlighted the pre-protest targeting of specific political protestors by the DC Metropolitan Police, as well as the use of less-than-lethal weapons and mass-arrest tactics during the anticapitalist and antifascist march. They also took issue with the lead detective, Gregg Pemberton, making any identifications of defendants based on watching video alone. Supporters of the defendants, who have come together as Defend J20 Resistance, argue that the prosecution has grossly overcharged defendants – the maximum sentence for all counts is over sixty years – and mischaracterized the march overall using a broad and historically problematic riot statute. “The prosecution, by working closely with DC Police Detective Gregg Pemberton, has been guided by a specific agenda that seeks legal approval for continued aggressive policing of protestors and residents of DC.” – Erin Lemkey from Defend J20 Resistance. The policing of protest at Donald Trump’s inauguration has been widely criticized and is subject to other litigation, most notably by the ACLU and the Partnership for Civil Justice. These lawsuits take issue with the tactics used during the mass-arrest and also the relationship between the DC police and right-wing organizations for surveillance on protestors they oppose. There is $150,000 earmarked for an active investigation into the conduct of the MPD on January 20th. The funds and investigatory task were given to the Police Foundation, who has provided no updates on their progress.